The fastest, the easiest, the most complete data from a portable tympanometric instrument Diagnosing chronic otitis media is often a difficult task. But the delivery of sound and air pressure to the ear, precisely measured by advanced microelectronic components, brings otitis media into sharp focus. 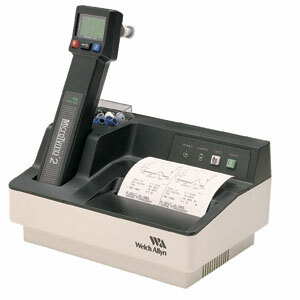 Welch Allyn's MicroTymp 2 tympanometry instrument produces an accurate, objective measurement of middle ear status. It also helps detect perforated tympanic membrane, patent tympanostomy tube, ossicular disruption, tympanosclerosis, and cholesteatoma. • Takes only one second to test and five seconds to print out the results. • Objective results ensure accurate diagnosis, referrals, monitoring, and easier consultations with parents. • Word prompts guide operator through the middle ear testing. • Results can be viewed in a tympanogram, numerical form, or interpretive messages. 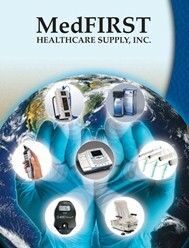 • Instant LCD tympanogram allows the operator to view test results before printing. • Lightweight and hand-held for complete portability. • Color-coded tips come in four sizes to fit any ear size. 1-year warranty extendable to 3 years with annual calibration.